Thinking about getting Sky Digital TV? Here’s the basics on how to get Sky’s satellite television service in the Republic of Ireland. The site you’re on now, Radio and Telly, is based in the UK, but we get lots of visitors from Ireland looking for help and advice on Sky TV, so we’ve added this page of information to help out those on the Emerald Isle. If there’s something you’d like us to answer or add, please let us know. Sky Digital is the market leading provider of digital TV services in Ireland. The vast majority of homes in Ireland should be able to receive the Sky signal. To be able to receive Sky’s satellite signal, you’ll need a satellite dish, which Sky will provide you with. After Sky’s engineers have called round to fit your satellite dish and box, you’ll be able to watch hundreds of digital TV channels, and listen to a wide selection of radio stations. If you have an HD-ready TV set, you’ll also be able to get the largest selection of HD channels available, if you decide to go for Sky+HD. 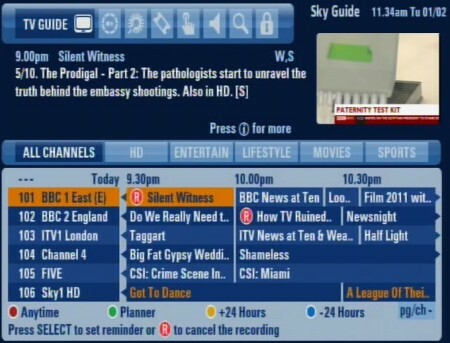 How do I get Sky Digital in Ireland? To get Sky Digital, you’ll need to have a satellite dish and a Sky TV digibox installed at your home, and you’ll need to pick one or more of Sky’s digital channel packages to subscribe to. You can order Sky online – when you book, you’ll be able to select a date for installation (including Saturday and Sunday installation in some cases). One of Sky’s engineers will turn up and install the Sky dish and digibox, connect it all to your telly, and set everything up for you, so you’re ready to watch. Hundreds of digital TV and radio channels – Far more channels than you’ll find on any other TV service in Ireland – View Sky’s packages. Sport – Unrivalled sports coverage with 4 Sky Sports channels, Sky Sports Extra , Sky Sports News, plus Eurosport , ESPN Classic and attheraces. Sky’s a must for football, rugby and cricket fans. Extras: Sky offers the widest choice of High-definition content, as well as their revolutionary Sky+ digital video recorder. If you sign up to Sky’s TV service, you’ll be provided, for free, with the Sky+HD box. Got a question on Sky Digital? Need help setting up Sky?